#4 (r1.3 only) An unpopulated resistor that can trickle-charge a battery when fitted (if the battery is less than 4.3v). See the Battery page for more information - only fit this if you're absolutely sure that your battery type can handle it. Espruino has 3 ways of powering it - a JST PHR-2 Battery connector, Micro USB, or pin headers. Both the Micro USB and Battery connector can power the device (and pin headers), and the source of power will be automatically switched. If you power Espruino via the Pin Headers, do not plug a battery in, and do not plug in USB unless you are powering it with 5v or more. If you wish to power Espruino from mains, we'd suggest using a Micro USB phone charger. This are widely available as the majority of mobile phones (with the exception of iPhones and low-end Nokias) now use them. In order to protect the Espruino board (and what it is connected to), a 1000mA thermal (self-resetting) fuse is on the board between the pins marked 'Bat' on the board and the power source (USB/Battery). See Connecting Batteries below for information on connecting Batteries. NOTE: The Espruino board has no case and so the USB connector is completely unsupported. This means it is relatively delicate (especially on rev 1v3 boards) and needs to be treated carefully. Try and pull the connector straight out, and do not push down on the board when the connector is inserted, or try and move the board around using the cable. You can usually buy batteries with the PH-type 2 pin female JST (PHR-2) connector ready-soldered, see Battery for more details on battries and connectors. See the Pin Strip page for ideas on how to connect servos, and the Servo Motors page on how to control them. To drive motors there are two good options - both of which solder on to the prototype area (which is designed for SOIC-style chips). The surface mount versions of these will require some soldering skills, so if you only need to turn motors on and off (and not drive them at different speeds) then a Relay Module might be easier. The L293D is slightly more expensive, but has four outputs, each of which can pull up to a voltage as well as down to 0v. This makes it ideal for driving motors in forwards and reverse, as each side of the motor can be connected to an output. The ULN2003 has 7 x 500mA outputs, but they can only pull down to 0v. This makes it great for powering relays, solenoids and stepper motors - but only useful for motors if you only need them to run in a single direction. 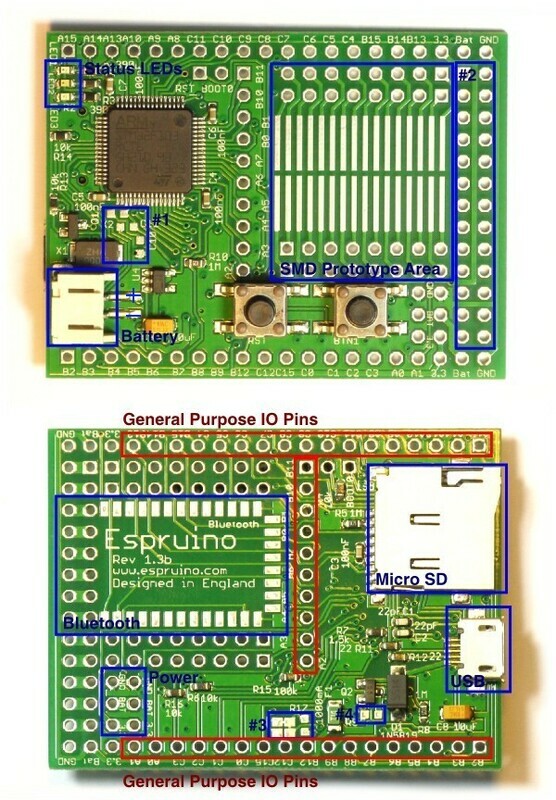 Espruino is designed for HC-05 modules. Have a look at the Bluetooth page for more information. The USB bootloader as shipped on Espruino KickStarter boards requires the APB1 clock frequency to be changed before it will work reliably. This is automatically handled by the Web IDE's flasher (diff), and also Espruino's version of stm32loader.py if you supply the -k switch. Please see the Troubleshooting section. We'd strongly recommend that you use the Web IDE to update the firmware on this board - See The Download page for instructions. In case you manage to erase all your board's flash memory you can use the on-chip bootloader though - see below. Note: BOOT0 is in a group of two pins (RST and BOOT0) in the middle of the top edge of the board. Then, dab reset to enter bootloader mode and use the STM32 flasher utility to flash the STM32 chip. 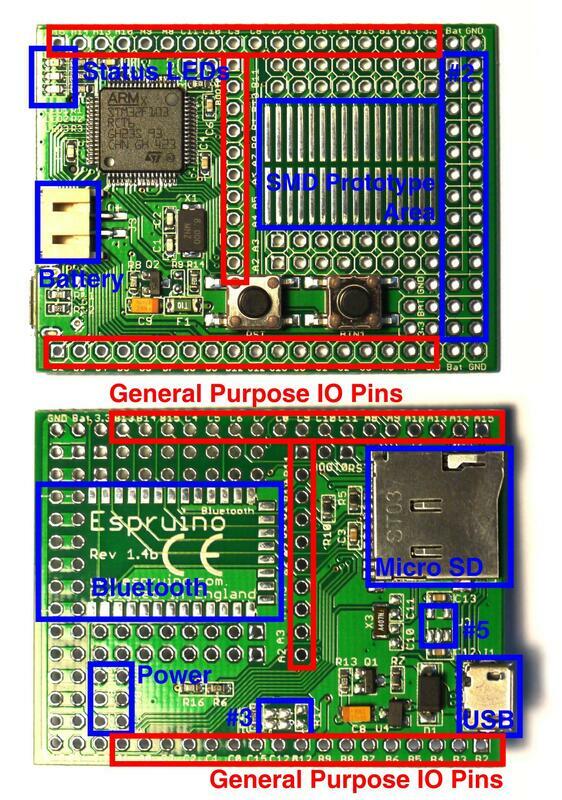 You might also want to see the Advanced Debug page for details on how to debug the Espruino Interpreter using an ST-link debugger. This page is auto-generated from GitHub. If you see any mistakes or have suggestions, please let us know.